CALL US NOW IF YOU ARE HAVING ISSUES WITH YOUR HOT POINT REFRIGERATOR! We are open 24/7. Issues with your refrigerator may start out as a small problem, but a little excess water on the floor or frozen food in the back of your Hotpoint refrigerator can be incredibly frustrating, especially as it happens more and more frequently over time. On top of that, if you choose to ignore these problems for too long, eventually you put the entire fridge at risk of complete breakdown and the need for replacement – something that will cost you much more than a simple repair visit. That’s why it’s so important to call All Time Services the moment you notice any issues with your Hotpoint refrigerator. If you live in the greater Washington D.C. area, Virginia, Maryland and Arlington. 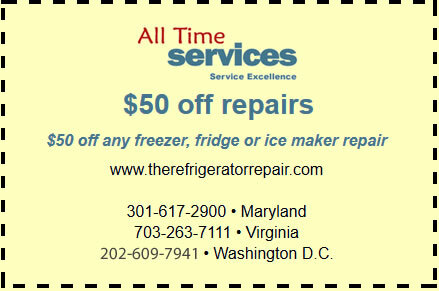 call us now to set up an appointment with one of our expert fridge repair technicians. To pinpoint a problem with your Hotpoint refrigerator, you must first pay close attention to its normal operations. A properly running refrigerator will cycle on and off throughout the day, keeping food at the desired temperature – according to the thermostat. The door will seal tightly on both the fridge and freezer unit to keep moisture out and the evaporator coil will draw moisture away from your food to keep it fresh. If you notice food spoiling quickly, freezing in the refrigerator unit, or ice building up in your freezer, your Hotpoint refrigerator isn’t working properly. These are signs that many people disregard because they seem like minor inconveniences. However, they can lead to bigger problems such as leaks, broken door seals, constant running of your compressor to keep the food cold (or because the thermostat is malfunctioning), and loud noises coming from the motor and compressor unit. If any of these problems occurs, you may have a more serious problem on your hand – one that warrants an immediate call for repairs on your Hotpoint refrigerator. 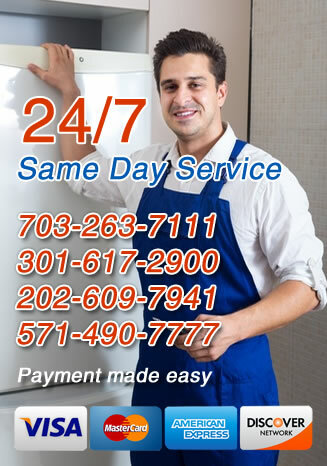 For professional Hotpoint refrigerator or fridge repair Services Virginia, Washington, DC, Maryland, Arlington, Gaithersburg, MD and the surrounding areas, call All Time Services today. Our technicians are highly trained and have years of experience repairing Hotpoint refrigerators, so you can be sure we’ll have yours working again as quickly as possible.